Teff, also known as lovegrass, is an important food grain in Ethiopia and Eritrea, where it is used to make injera. Teff is also grown on a small scale for human consumption in India, Australia, the Netherlands, and the United States, and as cattle feed in South Africa. Teff is believed to have originated in Ethiopia between 4000 BCE and 1000 BCE. Teff produces up to two-thirds of the total food provision of Ethiopia. Teff is the world's smallest cereal, with each grain being less than 1/32 in (0.8 mm) in diameter. It takes 150 grains of teff to make up the mass of a single grain of wheat. Due to its small size, teff has a very large percentage of its mass made up of the bran and germ of the seed, with a relatively small endosperm. It is also difficult and expensive to remove the bran and germ of such a small grain, so almost all teff products and teff flour are made of whole grain teff. The grain has a high concentration of different nutrients. 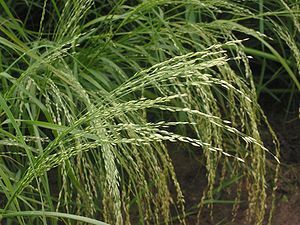 This grain has a very high calcium content, and contains high levels of phosphorus, iron, copper, aluminum, barium, and thiamine. Teff is high in protein. It is considered to have an excellent amino acid composition (including all 8 essential amino acids for humans) and has lysine levels higher than wheat or barley. Teff is high in carbohydrates and fiber. It contains no gluten, so it is appropriate for those with gluten intolerance or Celiac disease. This module is adapted from the Wikipedia article Teff. Please see the Wikipedia article for a list of authors. This page was last edited on 27 January 2007, at 01:23.